What to expect after Dupuytren’s surgery and what to do to get the best possible results. This webpage can be downloaded and printed out, we advise patients to do so and discuss it with their doctor before starting exercises. You can expect a bulky bandage covering the palm and the fingers that were operated on. In most cases the fingertips of the affected fingers will not be covered so you can see them, they should be a normal pink colour like your other fingers. Hold your hand high as much as possible the first 2-3 days. You can put it on on a pillow when in bed and against your chest when sitting or walking, to reduce the risk of swelling as much as possible. You can expect some discomfort or pain, most people take painkillers for up to a week. Check with your regular doctor which ones are suitable for you if you are unsure. Gentle movement of all fingers is usually advised after 2-3 days this will stimulate the circulation (you can use your other hand to gently move your affected fingers). Do not force the joints as this may cause damage to small blood vessels, and that may cause more problems. If you see any blood or fluid coming through the bandage, or redness in the skin either side of the bandage. It is best to ask the hospital for advice as this is not expected. For any swelling that comes up suddenly please phone the hospital for advice. If the tips of the fingers that had the surgery have a different colour (paler or more red, or blue) than your other fingers. Once the bandage has been removed ( sometimes the next day, sometimes only after 1 or two weeks depending on the exact procedure done), you will likely be given exercises to start. The stitches may still be in, they tend to either be removed after about 2 weeks or be left to come out by themselves if they are dissolvable. Be very careful not to do too much, even normal household tasks (carrying shopping, hoovering with that hand.) can be bad for the wound healing. The bandage should not get wet, cover it in plastic (a sandwich bag or clingfilm for instance) if you are going to do anything involving water. Once the bandage is off you can carefully wash or wipe the hand but do not soak it, keep it dry as much as you can. You can use moist cotton wool or a cloth to clean the other fingers properly if needed. As soon as the skin has healed start moisturising the scar area, to keep it soft and get a stretchy scar. Some swelling and stiffness is very common, especially the first few days , if it lasts longer than that sometimes a sleeve on the finger or applying an elasticated bandage now and then can help (don’t do this unless advised by a therapist so you know how loose or how tight to do the bandage). If using a bandage make sure you wrap it around the finger starting at the tip! Once you start doing exercises sometimes part of the wound may open again, and a few drops of blood may appear. Normally this is only the superficial layer of skin and only 1-2mm wide. This is not uncommon and tends to heal quickly. Some numbness and pins and needles in the finger or the wound area can happen, and tends to take a while to settle. Expect reduced grip and strength for at least 2 months in that hand. 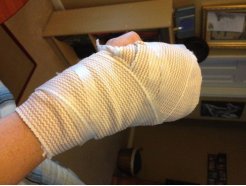 Making a fist can be the most difficult thing after surgery, even if before that was no problem. This will need a lot of work. Exercises! About 5 % of patients heal slower than expected, and if you have a skin graft as well you will definitely need more time. 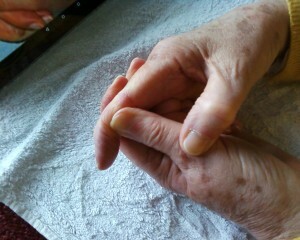 MCP: using other hand to hold the large knuckle straight, bend the rest of the finger, then straighten. PIP: using the other hand to hold the large knuckle and the middle joint straight, bend the tip, then straighten. Finger Walking (Spreading the finger)s Rest palm on flat surface, move thumb to the side, slide one finger at the time toward the thumb. Use the other hand to bend the middle knuckle and the tip of the finger, hold for 10 seconds. Use the other hand to gently bend the tip of the finger, hold for 10 seconds. Using your other hand push the large knuckle joint down then bend the other joints, till the finger is completely flexed (or as far as possible). Then push all joints straight. Do one finger at the time. 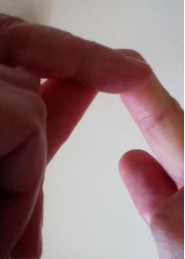 Active bending the fingertip (DIP) while blocking the PIP joint with the fingers of the other hand. Make a fist then straighten your fingers using only that hands muscle power. Strengthening exercises can normally be started at 6-8 weeks post surgery. 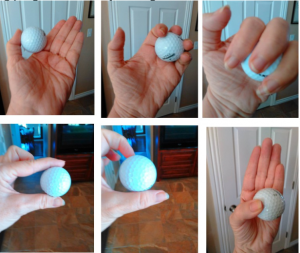 Squeezing first a sponge ball, and later a rubber ball can make the hand exercisers more effective. Splints come in two types, static and dynamic. Dynamic is normally used during the day to help push the joints straighter and flex against a slight force. The dynamic splint has to be worn so that it does not push the tip of the finger up. It should give a gentle straightening push but not so much that it hurts or feels uncomfortable. It may need replacing or adjusting a few times as your finger straightens up. Static splints are usually worn at night, to prevent the finger bending again. They are often used for 3-6 months while the scar tissue settles, otherwise it may contract. The splint should be comfortable to wear and are not meant to straighten your finger, just to prevent it contracting again. Sometimes the splint just covers the finger, sometimes part of the palm as well, depending on which joints were affected. The use of splints is controversial, some surgeons will prescribe them, while others won’t. If you did not get one but feel it might help please ask your doctor or therapist! The Pulvertaft Hand Centre in Derby have produced an app to help you remember to do your exercises and which ones to do.